My wife wanted to attend mass on Sunday from 11:00 to noon so I looked at what was happening at that hour to keep busy. Our first scheduled show was Richard Thompson with the Knoxville Symphony Strings with K.I.A. at 1:30 at the Bijou – or the Alvin Lucier and the Ever Present Orchestra [with Steven O’Malley and Oren Ambarchi] performing the works of Alvin Lucier @ the Knoxville Museum of Art. At the last night’s Budd show, the gent sitting next to us got a cough drop from my wife [he needed one!] and he was part of the Ever Present Orchestra. I saw the panel on ECM records @ 50 that was actually close to the church where I had dropped my wife off at so it got the nod. There was no music yet. But there was a queue outside of the Visit Knoxville center that was hosting the event. And it was not moving. I wondered if it was the overspill line already, but no, the event was running late. We got into the small room some time around 11:15 and I was able to stay for an half hour before rendezvousing with my wife. On the panel were David Torn and a host of artists [see above cutline] that I was unfamiliar with. 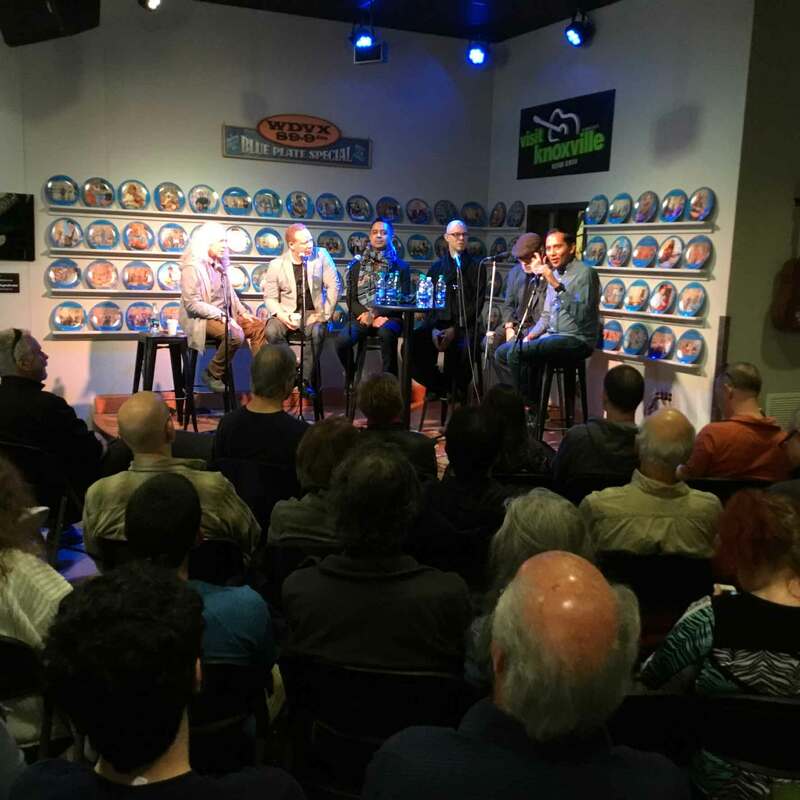 The panel was moderated by Nate Chinen and both his questions and the artist responses were interesting to a music fan like me no matter how few ECM Records discs were in my Record Cell. The significance of certain labels is something dear and dear to the heart of every music geek, and it was interesting hearing more about ECM, who I had known by reputation since the early 80s, although I only ever owned a single ECM disc [until this weekend]. I left the discussion to meet up with my wife and see what she wanted to do next. Richard Thompson + The Knoxville Symphony Orchestra: K.I.A. While I had been interested in finally seeing/hearing the much-vaunted Richard Thompson on the front end of the festival, I was open to seeing the Alvin Lucier show. Even though the presence of Steven O’Malley from Sunn O))) in the lineup frightened me. My wife opined that the Thompson show was very atypical for him [and it certainly was!] so that we should ultimately take the opportunity to see that after all. We had received a notification from the Big Ears app that informed us that audience could only leave the show at its intermission, which also sat well with us. One of the banes of festivals are people coming and going throughout the performance [except when we HAVE to leave… immediately!]. We walked to the south of downtown Knoxville and got in the queue. Oh my goodness. It was our friend Travis in front of us again. Well, we chatted some more and I met a gent behind us who was thinking of retiring to Asheville, our home town, so we spoke about the vibe there. Once again, I saw Cristina Horn of Hudson K in the VIP line but she was talking on her phone so I missed the opportunity to chat. This show was starting exactly on time so we sat in the vintage vaudeville theater and got ready for some heavy going. Thompson’s K.I.A. was commissioned by the WWI Centenary and it was a grim parade of new forms of death and destruction wreaking havoc on teenaged doughboys way out of their depth in the trenches of WWI. Much of the lyric text had been taken verbatim from letters and communication from the war, but not all of it. There was a semblance of musicality that was just there to hold it all together. The occasional composed phrase/structure from Thompson. He played acoustically for this show and I have to admit, I was quite taken by his authority with a guitar. His reputation for being a player’s player was quite evident by his acoustic playing and I would enjoy the chance to hear him plugged in as well. I was less taken by his singing. As I feared, Thompson, coming from the folk music side of the fence, tended to employ that “Celtic lilt” in his singing that rubs me so strongly the wrong way where folk music is concerned. I cannot fully embrace the form largely due to this factor. The arrangements of the material for orchestra showed nuance and sensitivity, but the vibe was unremittingly grim. If Thompson was attempting to capture a portrait of the first modern war, in all of its horror, he succeeded admirably. After an intermission, the second half of the set continued with a program of more typical Thompson material. Next: …[spoiler alert] Nik Bärtsch’s RONIN Blows Our Little Minds! This entry was posted in Concert Review and tagged 2019, Big Ears, ECM Records, Richard Thompson. Bookmark the permalink. I’ve enjoyed a fair number of R. Thompson’s songs but his voice — while perfect for some things — is the weak link in his work IMO. It’s a voice for workmen songs and kitchen sink dramas, but when he’s doing something else it kind of grates with me. That said, he’s certainly a genius on guitar and a fine songwriter. His “Celtic lilt” comes naturally: while he was born in west London, his father was a Scot. Did you know the first band he formed had Hugh Cornwell in it? Anyway: his personal outlook has generally been one of a darker disposition, so I’m not surprised he took on this project. For a rather more chipper (but still horrifying) look at WWI, I can commend the film They Shall Not Grow Old, a documentary that really leverages modern technology to bring those who fought in that conflict “back to life,” in a sense. I’ve listened to Nate Chinen on many podcasts for the NYTimes and NPR… he has a way of talking about music (particularly jazz) that always gets you excited about the subject at hand, even if you were unfamiliar with it previously. bpdp3 – Not familiar with Chinen as I gave up on NPR over a dozen years ago.